Leverkusen moved six points clear of Dortmund with a well-deserved victory. Jurgen Klopp was still without a host of defenders and Ikay Gundogan, and Marco Reus was fit enough only for the bench. Sami Hyypia made one change: Omer Toprak replaced Philipp Wollscheid in the centre of defence. Leverkusen were the better side here – more assured defensively and more purposeful with their attacking. The key to this game was the unusual shape used by Hyypia. Although Leverkusen are generally described as a 4-3-3, this was something very different: lopsided and slightly complex. Nevertheless, it stopped Dortmund passing the ball easily through midfield and created a succession of chances, and therefore can be considered highly successful. The key to the system was the role of Jens Hegeler, not usually a regular in the side. If this was a 4-3-3 you would have expected him to play on the right flank, but instead he generally occupied a central position, almost at the top of a midfield diamond. He appeared to have two main responsibilities – shutting off passing angles into Dortmund’s two deep-lying midfielders (particularly Nuri Sahin) and providing an option for forward passes. He half-heartedly drifted out to the right flank when Dortmund had possession, but there was no particular urgency shown in getting back and tracking Erik Durm. Hyppia seemed happy to leave Durm alone, and instead used Hegeler to restrict Sahin’s movement, and provide an outlet on the break and for long balls. 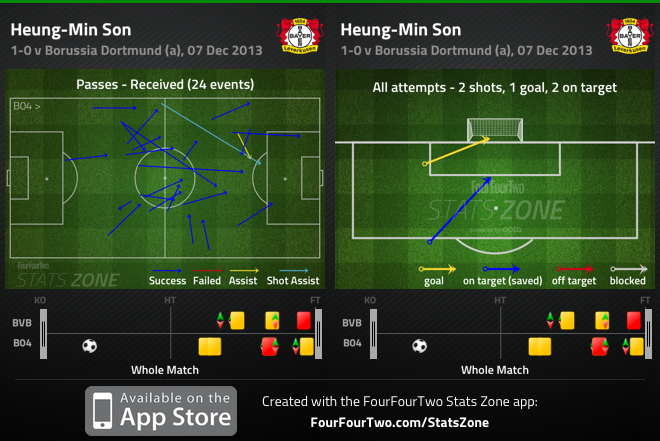 Towards the other side was Leverkusen’s key attacking player, Heung-Min Son. The South Korean played as an inside-left and repeatedly made dangerous runs in behind the Dortmund defence, providing the penetration for Leverkusen’s quick attacks. His speed created the first genuine chance of the game, when he got in behind then held the ball up and teed up Hegeler, but he was even more of a direct threat for the game’s two best chances. The first came from poor Dortmund passing at the back – a sloppy pass was intercepted and Leverkusen needed only two passes to transfer the ball to Son in behind. He rounded the goalkeeper and scored. He could have extended the lead shortly after, with a simple counter-attacking move that demonstrated Leverkusen’s system perfectly. 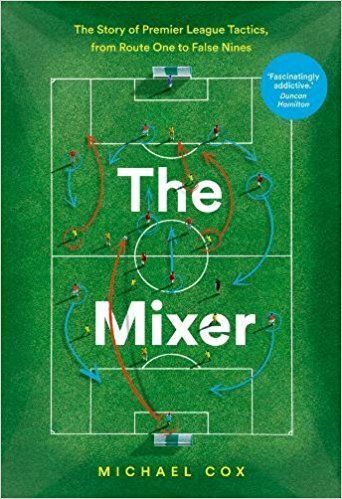 Hegeler picked up the ball unmarked, slipped a pass around the corner for Son sprinting in behind the centre-backs, and Roman Weidenfeller saved the one-on-one. Also crucial to Son’s movement was the role of Stefan Kiessling, renowned as a penalty box specialist. He showed intelligence in his movement here, continually coming towards play to receive the ball in dangerous positions and encouraging the other attackers – particularly Son – forward into attack. There was also some dangerous overlapping from left-back Emre Can, even if he continually cut inside onto his right foot. Gonzalo Castro’s steady positioning allowed him to stretch the play on the left, in turn making sure Son could drift inside. 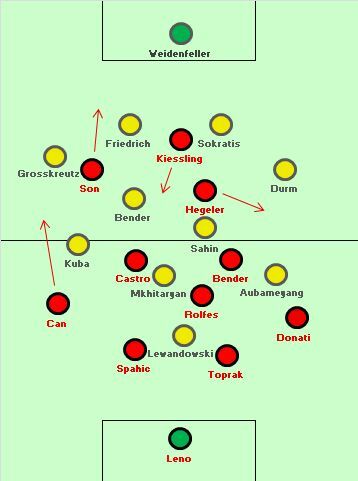 With Leverkusen playing such a narrow midfield, the obvious route for Dortmund to attack was down the flanks. With Reus only on the bench, Dortmund had more natural wide players than usual – both Pierre-Emerick Aubameyang and Jakub Blaszczykowski instinctively take on opposition full-backs down the outside. But Dortmund didn’t transfer the ball out wide quickly enough to make this a consistently promising outlet, with Leverkusen’s shuttlers moving across effectively to shut down the space. Kevin Grosskreutz was a threat from right-back, as we’ve become accustomed to this season, but Durm did extremely little with his freedom down the opposite flank. The game’s outstanding player was Simon Rolfes, who completely nullified the threat of Henrikh Mkhitaryan. It’s fair to say the Armenian playmaker is nowhere near as effective when playing against a deep defensive line, and Leverkusen’s overall strategy helped highlight his weaknesses, but he was also completely dominated by Leverkusen’s captain throughout this game. With Mkhitaryan not involved, Dortmund lacked a link between the midfield and Robert Lewandowski, who came increasingly deep to collect possession. Emir Spahic was often the defender to follow him, with Toprak sweeping up behind. In recent weeks it’s become particularly obvious that Dortmund look utterly exhausted. It’s important to remember that they’re suffering from severe injury problems, particularly at the back, and this might explain why they’re reluctant to press so intensely high up the pitch (and instead sit deeper) for fear of exposing the centre-backs – particularly Manuel Friedrich – against pacey forwards. Klopp denies that the injuries are a result of constant intense pressing, but the tiredness surely is. Dortmund still don’t have a large squad, still aren’t used to rotating regularly, and in their fourth campaign as a genuinely top-class side, might be in desperate need of a break. Jonathan Wilson has previously put forward a convincing argument about the ‘three-year rule’, saying it “seems particularly to apply to sides who play a hard-pressing game,” and while Klopp has completed more than three years at Dortmund, the European Cup final marked the end of Dortmund’s third year as a genuine title challenger. Their tiredness in that match was crucial to the outcome, and it seems to have continued into this campaign. Without that burst of energy, his side seem much less dangerous with the ball, and significantly more vulnerable to quick attacking. Their pressing was poor here, and with Hegeler finding space between the lines, Kiessling dropping off and Son attacking in behind, Leverkusen constantly exposed Dortmund in a manner we’re not accustomed to. The second half was scrappy and disjointed, featuring six yellow cards and two late reds. It became an ugly spectacle as Leverkusen shut down the game without offering such a counter-attacking threat, and while there were constant positional changes as Klopp attempted to switch to a more attacking style, there was no cohesive Plan B from Dortmund. Sven Bender’s injury promoted Klopp to turn to Marco Reus, who played a more central role than usual, but found his pace wasn’t particularly useful against a Leverkusen side that sat extremely deep, and protected the centre of the pitch keenly with three cautious midfielders. Jonas Hoffman replaced Blaszczykowski, played down the left with Aubameyang going right – this changed little, and Aubameyang seems particularly ineffective against good sides that sit deep, as he also contributed nothing when appearing late on against Arsenal. Leverkusen’s only worry was the red card to Spahic, which forced Hyypia to bring on Wollscheid in place of Son, who hadn’t been offering much threat on the break in the second half anyway. Individual positions changed but the overall battle remained the same – Lewandowski was Dortmund’s only hope of breaking down the packed defence, but Leverkusen stood strong. Dortmund weak or Leverkusen strong? 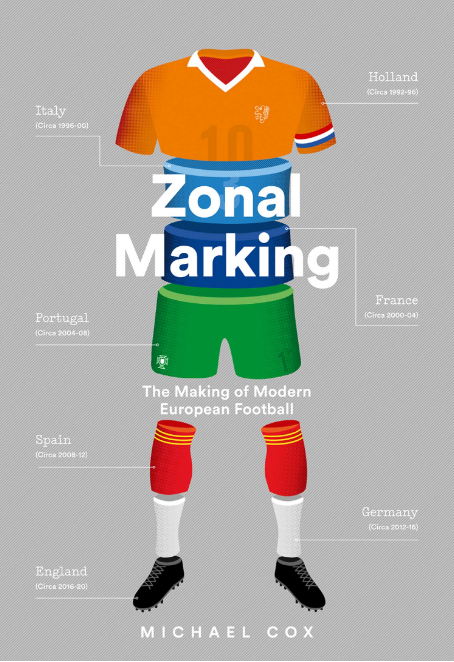 It was a combination of the two – Dortmund’s current problems are well established, and Hyypia set up a team to expose their lack of pace at the back, and their lack of pressing in midfield. Hegeler’s position caused problems, Kiessling dropped away from the centre-backs rather than engaging them in a physical battle in the air, while Son provided the pace in behind. Dortmund were stretched in two ways, and with their poor pressing high up the pitch, they couldn’t play a high line successfully. Theoretically Leverkusen were wear down the flanks, but the shuttlers move out wide effectively to offer the full-backs support, and Dortmund didn’t switch the ball quickly enough to the full-backs, who are technically limited. Bayern should run away with the league, but this confirmed that Leverkusen, not Dortmund, are the closest thing to realistic challengers. The starting line-ups figure is blank in my Safari browser. Good grief, it’s just popped up. You must have a crystal ball. Leverkusen will most likely play a worse second leg again. They’ll come in third or fourth. The team doesn’t have the mental strength to challenge for titles.